Welcome to Northwest Equine Outfitters, based out of Salem, Oregon since 1996. 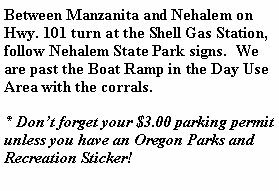 Currently offering Beach and Trail rides on Horseback at the Nehalem Bay State Park. Come view the park in all of its Splendor with wildlife like elk, deer, seals, coyotes, bald eagles and many others too numerous to mention. Northwest Equine Outfitters offers various Riding Packages to please your riding desires. Fun for the whole family (Ages 6 & up) at any riding level! Special Reservations Available in "Off Seasons"
2 hour rides starting at 7:00, 8:00, or 9:00 AM. Ride during one of the most tranquil times of the day. The weather is usually calm. Ride through the dunes to the beach and "view hill" to see the seals and the whole peninsula. 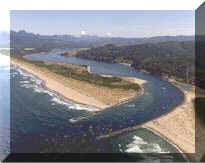 Ride through the dunes onto the beach, take a trail back and see a beautiful view of Nehalem Bay and the Pacific Ocean. A fun ride where we cover a lot of ground! Ride through the dunes to the beach and the trees to the bay. Then follow a trail where bald eagles, elk, coyotes, deer, and rabbits are some of the wildlife commonly seen. Next we go to a lookout we call "view hill" where the whole peninsula can be seen. Watching the seals basking in the sun is our next stop before returning to the corrals from the bay shore. A great way to end the evening, riding through the dunes onto the beach where it is so relaxing to watch the sun set. 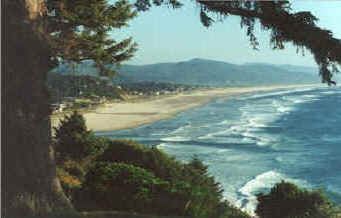 We take a trail and see a beautiful view of the Nehalem Bay and the Pacific Ocean. Our trail goes through a dark grove of trees where people marvel at the horses' sight, and trust their horses as they move toward the moonlit sky. This is truly everyone's favorite ride! 2 Hour Sunset Ride "A Favorite"
An old Favorite and Popular ride! Our newest and most popular ride. All the great treats of the 1 Hour Sunset Ride, with the wilderness addition, plus the beautiful panoramic view of Nehalem Bay, Pacific Ocean and the Nehalem Bay State Park Peninsula from the lookout. Also to include visiting the harbor seals at dusk. This is an unforgettable ride for the honeymooners or wildlife enthusiasts. Bring shoes you don't mind getting wet as we go in the bay when high tide correlates with this ride! This is truly everyone's favorite ride! 1/2 Day Ride "Oregon Coast's Best"
This ride is either before Sunset or with Sunset. Riding through the dunes and trails taking in the beautiful views that the Nehalem Bay State Park possess. Along with the beach, the bay,the seals, and the lookout, we tie the horses and get picked up by a boat where we go across the bay to find fresh crabs and oysters being cooked! After finishing a fresh Oregon feast, we take the boat back, watch the seals up very close and ride for the rest of the day! All Day Ride "Oregon's Best"
Our newest and most breath taking ride. 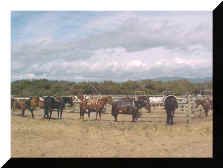 We trailer the horses in the morning to some high mountain lakes south of Tillamook, pack a lunch and ride. 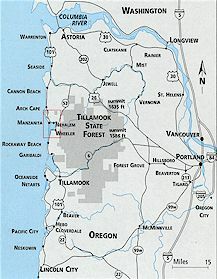 The scenery takes in beautiful forests, several bridges, "switch backs", and cantering up to the "Top of Oregon" where 3 mountains and sisters can be seen on one side and Neahkahnie Mountain, Garibaldi Bay, Tillamook Bay, the Three Capes, and endless ocean and mountain ranges can be seen for the rest of the 360° view. On the way home we stop and have seafood, steak at a scenic viewpoint restaurant. Recommended for Advanced Riders or you will become an advanced rider!